I thought that my recent post on Mumford and Sons was a fairly minor affair, but it turned out to be one of the most popular for a while. Certainly one of the most commented on. One of these comments came from a shadowy figure called Neil who complimented the post, but then commanded me to write about Jay Jay Pistolet. Well, erm…OK sir. The thing is, I’ve been intending to write about JJP for a while after hearing him play a live session on Marc Riley’s old 6Music show at the end of last year. I recorded the songs but have never got round to editing them, and since they’re on my old computer, I’m not sure when my tardiness will allow them to see the light of day. But thanks to Neil, I now have a bundle of songs on my computer which I have been enjoying lately. 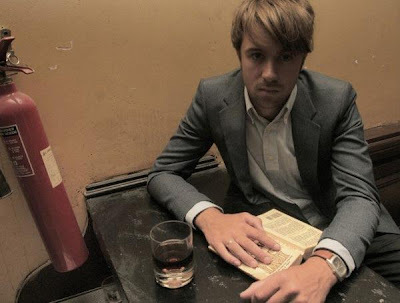 So, Jay Jay Pistolet is Justin Hayward-Young from Hampshire, now resident in South West London. In the 6 Music interview I seem to remember he mentioned some other musicians that he lived with, whom I had never heard of at the time, but thanks to Neil I now know that one of these housemates is Marcus Mumford. He may or may not have tried to form a band called The Pistolets, before staying solo with a double prefix. He comes across like a sort of English troubadour, a sort of young home counties M Ward, blending classic British and American folk music with relative ease. In that way he’s similar to Johnny Flynn, but there’s less of the violin-led hoedowns going on. The songs I have seem to be mainly demos, since JJP has only released one single so far – We Are Free on Chess Club Records last November. Although he seems to have amassed a lot of songs, he’s not ready to record his debut album yet. According to this interview, he’s “really keen for my first album to be great and I just don’t think it would be if I was to record it any time soon!” This perfectionism extends to him dissing his own single in a recent myspace blog “I’m pretty ashamed of my songwriting on the ‘we are free’ single” he says, though he seems confident enough of other material to want to release an EP “in the coming months”. I await that with interest. On the strength of the material that I’ve heard he’s got nothing to worry about – even with We Are Free. He’s one of these songwriters who wields an acoustic guitar and treads a similar path to many, many more, but has that something special, that particular way with words and tunes which elevates him above the rest. In JJP’s case, pretty far above. So until I dig these BBC session tunes out, here are some of Neil’s tracks. Still, I guess it just gives me an excuse to do another Pistolet Post sometime soon. Good. thanks for this. jay jay is an incredible songwriter. love him.